Everton’s on-loan midfielder Gareth Barry was recently quoted as saying the above about where his future in football lies and it is without any doubt at all that I say this, and I am confident that every single other Evertonian will agree with me when I do; I sincerely hope that Gareth Barry’s future lies with Everton FC – his permanent signing is crucial, and it simply needs to happen. 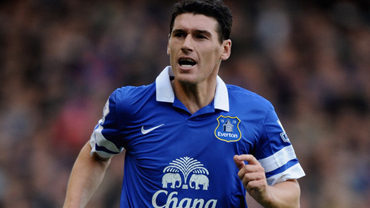 On deadline day in August 2013 Gareth Barry nervously drove around in his car waiting for news on his imminent loan switch to Everton but it wasn’t until the final moments of that said day that he received confirmation of his move to Goodison Park. Roberto Martinez was busy trying to tie up deals for a number of players including James McCarthy from Wigan and Romelu Lukaku from Chelsea, but it was Barry with over a decade of Premier League experience who was looking for a life line in his career after being frozen out at City – and it was Martinez who eventually completed a season long loan deal for the midfielder and offered him just that. Barry had been told by new Manchester City manager Manuel Pelligrini that he wasn’t part of his plans and the big-money signing of Fernandinho basically ended what was a four-year stint at the heart of the City midfield. Barry initially joined City for a fee in the region of £12 million in 2009, he went on to be a key member of the 2011-12 title winning side under manager Roberto Mancini and made well over 100 appearances for City during his time at the Etihad Stadium. But after being allowed to speak to clubs about a potential move away, including Arsenal, Barry arrived at Everton’s Training Facility Finch Farm in the summer of 2013 to conclude a deal to join Roberto Martinez’ Everton. Since then, he hasn’t looked back, and he has been nothing short of brilliant in Royal Blue. On Sunday, Barry turned out for Everton against Manchester United at Goodison Park in what could potentially be his last game as an Everton player on home turf. The 33-year-old is ineligible to play next weekend against his parent Club Manchester City but is likely to be involved tomorrow at Southampton and on the final day of the season away at Hull City. 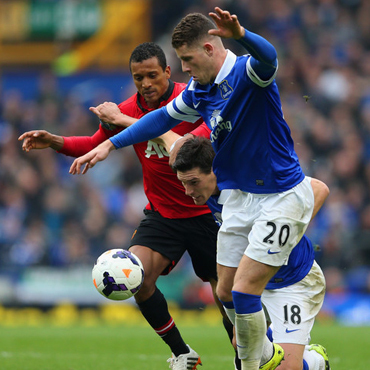 Barry was making his 30th League start for the Toffees against United – behind only Tim Howard (34) and Seamus Coleman (33) – in what has been an impressive season on Merseyside, and the former England international has been the subject of high praise from both his manager Martinez and us Evertonians who have been blown away by his consistency and fantastic attitude since arriving at the Club. I recently wrote an article about James McCarthy – the main points were to praise the Irishman for his performances at Everton this season and justifying his price tag – and that is something which I feel he has certainly done this season at Goodison Park. I wrote about my doubts about how we could spend so much on a young player and questioned whether he would come good in the Royal Blue of Everton, but I also said how happy I was to be proven wrong and made to eat my words. In this instance, and now that I am writing about Gareth Barry, I can draw a lot of comparisons in terms of doubts, questions and me being the football fan I am, jumping to conclusions. Again I have been made eat humble pie as Roberto Martinez pulls off yet another master stroke as first hand I have witnessed a sublime season from Gareth Barry in an Everton shirt. With McCarthy it was more about the money, and because we are so financially restricted the risks that could incur, but with Barry it was more my perception of him. I openly admit to believing he wasn’t much of a player; at Villa he stood out but at City he failed to excite me. But again, that’s the football fan you see – can you only judge a player when he plays for your team week in week out in front of your eyes? Maybe so. In this case definitely for me. I had a preconceived perception of Gareth Barry – a short-sighted one at that- and I now sit here writing this full of admiration and praise for the midfielder, who has left me nothing short of astounded with his displays this term. Solid, consistent, effective, tidy, assured, tireless – simply fantastic. Just a few words how I would describe his time on loan at Everton. A player who could have just come to Goodison Park to play out the last year or two of his career, earn a few quid then bail? A player looking to get a decent deal and play the odd game? A player hoping to just coast his way to retirement and finish his career with a whimper? A player looking to move down the league and take things easy? Or a player with a point to prove? A player hungry to show he still has it? A player still in the reckoning for his country and a player who still wants to mix it with the big boys of the Premier League? A player who can still dominate games and dictate tempo at the highest level? A player who has won league titles and still harbours ambition? Gareth Barry is all of the latter and much, much more. “He could be Man of the Match in every game this season” – Me Dad quoted as saying during the game against United on Easter Sunday. You couldn’t really argue with him, could you? We got ‘out-possessioned’ in that particular recent fixture but did that make Barry less effective? Not at all. Our new-found fluidity is based around calmness in possession, an assured confidence with the ball and an ability to be patient and wear the opposition down. Barry’s game is modelled on all of the above and together with his midfield partner James McCarthy, they boss games and dictate the run of play. At times this season Barry has received the ball off Howard and acted as the third centre back, as Jags, Distin or Stones move wider to create the space for Baines and Coleman to push on, and Barry plays that role so effectively and brilliantly it has been such a benefit to Roberto’s ideology and vision for this new-look, expressive Everton team. Throughout this season Martinez keeps the core of his side central to his ideas, he bases his selection around the spine of his team whom he keeps in the starting XI as regular as possible. From his regular back four to McCarthy and Barry right through to Romelu up top the foundations of this Everton side are a mainstay and that is why he can chop and change in other areas and utilise his squad where required. Barry and McCarthy have been at the heart of these successes from the off and Barry (30) is shortly followed by McCarthy (28) in the EPLstats count for starts. The partnership they have formed is not only formidable, it is so impressive too because they were both thrown into a new team together with a weight of expectation on their shoulders and they have both come out fighting and more than proved their worth to the Everton cause – be it on a temporary basis or long-term. Over recent years we haven’t been blessed with many great midfielders; Scott Gemmill, Mark Pembridge, Alex Nyarko, Li Tie and Phil Neville to name but a few. But we have had some decent names in that central position, I think Tommy Grav and Lee Carsley are two that probably stand out in recent times. In terms of different qualities we’ve had Mikel Arteta and Marouane Fellaini in there too – there is a list of names tried and tested in that position, and I know I’ve missed a load out – but in McCarthy and Barry, with Ross just in front of them, we now have a midfield that has all of the required makings of a successful one. Experience, youth, desire, energy, hunger, passion, assurance, belief, solidarity, toughness, flair – the current Everton midfield is absolutely brilliant in my own opinion, and that’s not to mention Darron Gibson too, remember him? I remember scratching my head when Liverpool were linked with a £20 million move for Gareth Barry many years ago and thinking ‘what a waste of money’. But I also remember wondering how he got in a City team full of stars during their fruitful few years not so long ago. Both are because I hadn’t seen much of Barry and just formed a typical football fan’s opinion of ‘he’s sh!te blah blah’ and made my decision on him based on that. But in Roberto Martinez and what I have seen from a number of players this season I have learnt a much-needed lesson that you have to embrace change, give people a chance, don’t write people off and don’t form your opinions on what you hear, read or only see now and again (Naismith, McCarthy and Barry are three prime examples). I’ll give you another example, and it is relevant because he plays for Man City; James Milner, a player who many fans would easily criticise or write off. But in reality he is a really good footballer, and one that is still in a Man City team even with all of it’s millions. Again it is the automatic perception of a player but when you actually take the rose-tinted glasses off you see what is before you. Gareth Barry has been the same for many years, but he has been in and around that impressive Man City team since the wealth and power first came onto the scene and the only reason he has now moved on is because of a new manager with new ideas and new players. Everton are now reaping the rewards of him being surplus to requirements elsewhere and whilst at the Toffees, Barry has more than proved his worth in the Premier League. Let’s not forget he is also one of only ten players to have played over 500 games in the Premier League too, which has a huge testament to his ability in itself. The former Brighton trainee has an abundance of experience, knowledge of the game and vast array of attributes that have been a huge asset at Everton this season and reading the statistics from our most recent game (vs Man United) below this piece just summarises how he has fared during his loan spell at Goodison Park this season. Although all eyes are on Everton’s final three Premier League fixtures as the campaign nears it’s end, most Evertonians will be waiting to see what happens with Barry in the summer, and I for one certainly hope the Club can tie up a deal to bring him to Merseyside permanently because he has been nothing short of superb since arriving here last August. He deserves all of the plaudits he gets and although my award for Player of the Season goes to James McCarthy (for the price tag he carried amongst other things! ), Barry has to be in contention for the award after such an impressive and influential nine months with the Toffees. There was talk of Bobby trying to sign him permanently in January but the deal never materialised. Let’s just hope the Blues can pull out all of the stops to bring him in once the season is over because Gareth Barry has this season very much proved to be the Midfield Maestro at Everton, and long may his reign here continue. Just to let you know, Deulofeu wasn’t a deadline day signing.